What is the date of the photo? October 14, 1905 taken on Jericho Turnpike in Mineola. 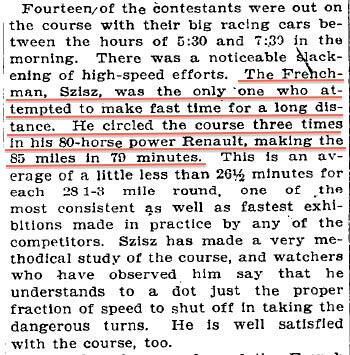 #10 Renault drivng by Hungarian Ferenc Szisz with mechanician George (Sergey) Dimietrivitch. Referee William K. Vanderbilt Jr. can be seen above the right-front wheel. Starter Fred Wagner is wearing the cap standing next to Willie K.
Congrats to Steve Lucas, Greg O., Chuck Rudy, Art Kleiner (see Kleiner's Korner), and Ariejan Bos for correctly identifying the 1905 Renault team. Kudos to Steve Lucas, Greg O., Chuck Rudy, Art Kleiner and Ariejan Bos for recognizing referee Willie K. and/or starter Fred Wagner. A long view of the Mystery Foto. Another photo of Renault's start. 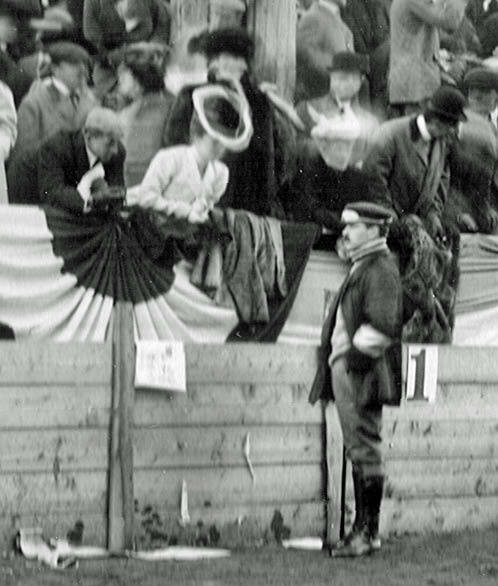 Willie K. speaking to his wife Virginia at the 1905 grandstands. 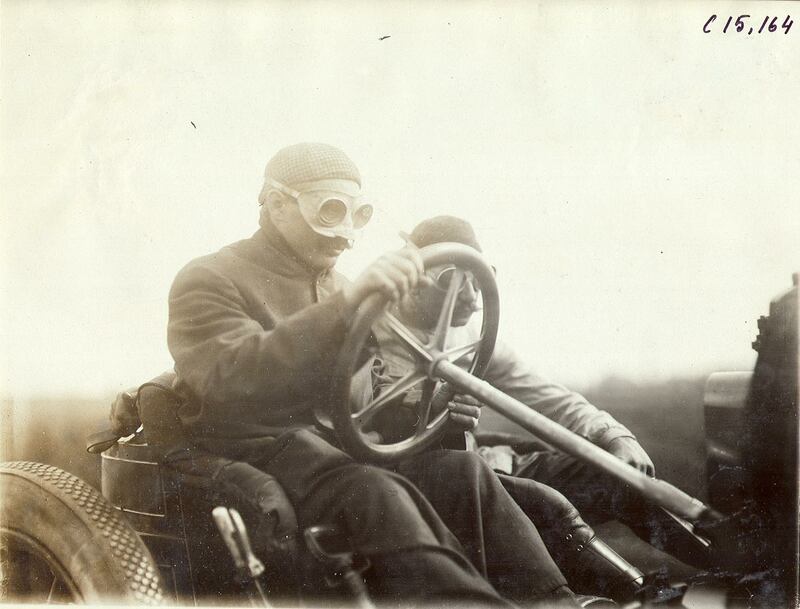 Fred Wagner (far left) ready to start Nazzaro's Fiat at the 1905 Vanderbilt Cup Race. 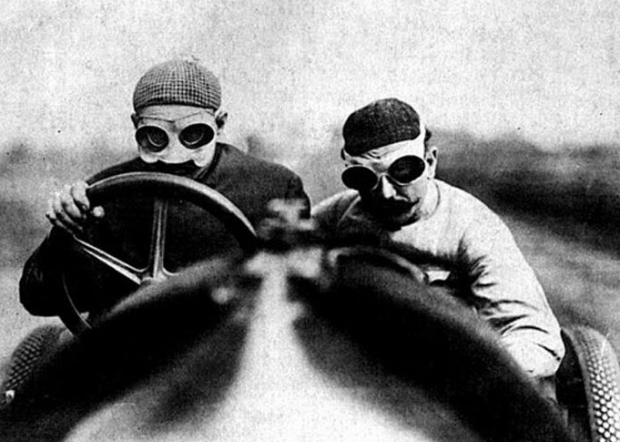 A close-up of Szisz and Dimitriewich preparting for the 1905 Vanderbilt Cup Race. 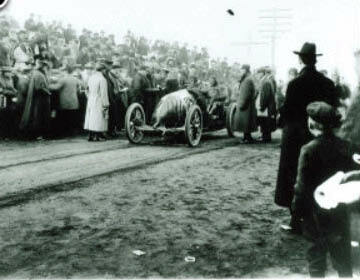 That looks like the number 10 Renault at the starting line for the 1905 Vanderbilt Cup Race on October 14, 1905. The driver is Ferenc (Francois) Szisz and the mechanician is Sergey (George) Dimietrievitch. Also in the photo is Willie K. Jr. standing directly over the right front tire. To his left could be Fred Wagner or possibly Peter Prunty. -What is the date of the photo? 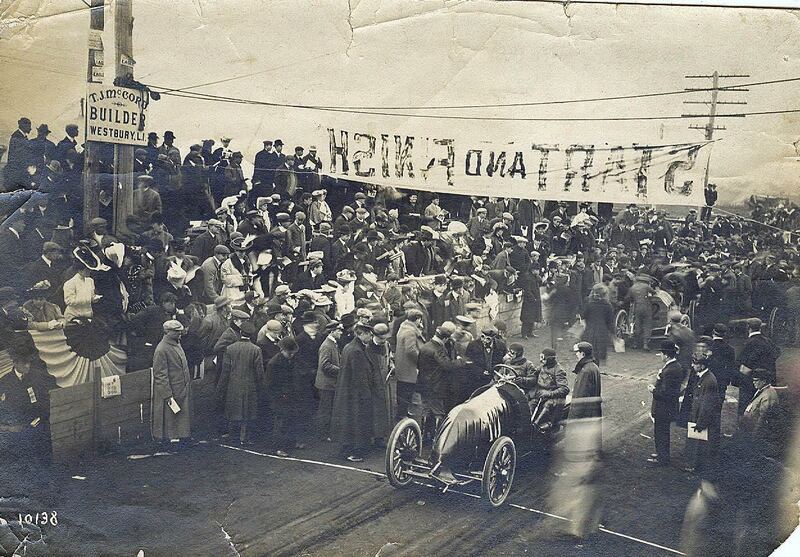 I believe that is a Renault in 1905 on October 14. If so it would have been driven by Francois Szisz with Mechanician George Dimietrievitch along for the ride. In the photo it appears Willie K is sporting his goggles on his hat near the RF tire. As far as anyone else in the crowd, I will have to wait to see what others will have to add. At first I though perhaps Teddy Roosevelt was hunched next to the driver at first glance but the more I looked the less I agreed with myself. 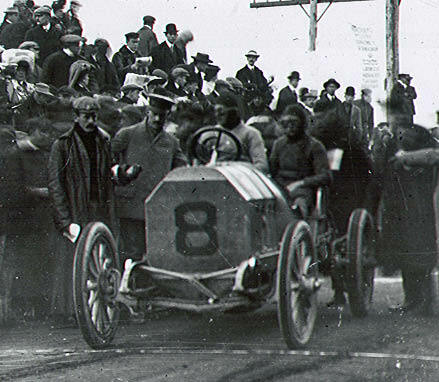 The photo shows the Renault with no.10 driven by François (Ferenç) Szisz at the start of the 1905 Vanderbilt Cup race, held on October 14th. 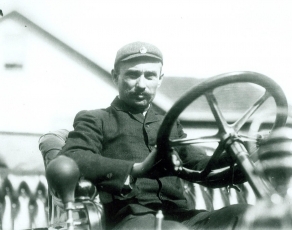 His mechanic was Sergey Dimitievich. Other persons on the photo are Willam K. Vanderbilt talking to a for me unknown person. The man bending towards the car seems to be Fred Wagner. Szisz would eventually finish on 5th place, more than a lap behind winner Hémery.